"Felt Like I Could Die"
The actor offers one of the best performances of his career, perhaps the very best, in The Road, the film adaptation of the novel that earned Cormac McCarthy the Pulitzer Prize in 2007. It is difficult to find a person as versatile and passionate as the actor Viggo Mortensen (Manhattan, New York, 1958 ). 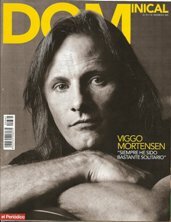 In twenty-five years of continuous and unconditional dedication to the world of cinema, where he made his debut with a small part in Witness (1985), the star of Alatriste and Eastern Promises has challenged himself with big movies (remember that he was Aragorn in the trilogy The Lord of the Rings) and independent productions, and he hasn't closed the door to any genre. He's also put himself into the hands of directors of very distinct profiles, among them such masters as Brian De Palma, Peter Jackson and David Cronenberg. Thanks to his command of several languages (Mortensen spent part of his childhood in Argentina, which explains why he speaks perfect porteño Spanish), he has filmed in many parts of the world. "I go for the tales, for the stories," he confesses during an interview that takes place at the Sitges Film Festival, where John Hillcoat's The Road - a movie which recently opened in Spain and about which we speak with him - was screened, and at which he received an honorary award for his contribution to fantasy film (The Reflecting Skin, 1990; the aforementioned trilogy The Lord of the Rings). That answer explains as much his flight from being pigeonholed as an actor as his being open to other fields. Ultimately, what matters are the stories and the ideas which are their backbone, and sometimes he finds them in film, others in music, visual arts or literature. Mortensen, who comes to the meeting wearing the San Lorenzo de Almagro jersey, the Argentinean soccer team of which he is an ambassador and fervent follower, is also a painter, has been part of several recordings (a lot of them spoken word, in collaboration with guitar player Buckethead) and has published books of photography and poetry. He also is a lover of theatre, a milieu where he got started and where he hopes to return shortly. Actually, he was expected to be on stage again next February 12 in the Teatro Español de Madrid, costarring with Emma Suarez in the play Purgatorio, by the Chilean Ariel Dorfman, but his mother´s health problems have forced him to postpone this project. The expectations generated by the possibility of seeing him perform live and the screening of The Road, the film adaptation of Cormac McCarthy´s novel of the same name, make him the man of the moment. Approachable and very kind, with that ability to fascinate that stars have, but without any hint of the coldness one attaches to them (and which a lot of them display), the star of A History of Violence (2005) spoke to us about his work on The Road. To him, more than a film: a challenge. "The challenge in the film was to find the way to bare myself from the inside, to be much more honest with the feelings than I had been with other characters in other movies." Had you read McCarthy´s books before deciding to get involved in the adaptation of The Road? I knew about his books and I had read some of them. In particular, I very much enjoyed Blood Meridian, a novel that was published for the first time 25 years ago. Just after reading The Road's screenplay I went out to buy the book, to see if the adaptation was a faithful one, and it really was. After that, during the rehearsals, we fine-tuned the story to be as faithful as possible to the novel. Have you met Cormac McCarthy personally? Yes, we agreed to talk, and I had all the questions I wanted to ask him written down. But in the end we just talked about our children, about how to be fathers. And I didn't need anything more. Were you afraid the the movie might end up being a toned down version of the book, and by extension, a betrayal of its spirit? It's true that when they arrive it seems there's nothing different from what they've seen before during their journey. But something has changed. They realize, and I think the viewer does, at the same time, that they've always counted on the love they feel for each other and on their capacity for goodness, tenderness and love. The character of the boy teaches my character that that it's worthwhile to act to prevent misery rather than to take revenge for it. That, on reflection, presents a certain optimism, and it shows in the film as honestly as it does in the book. Maybe that´s why the adaptation has been successful. Was this possibly optimistic reading of the story the thing that most attracted you to both the novel and the film? In part, yes, but without forgetting that it is necessary to make the journey and suffer all that must be suffered to come to that conclusion. Without the previous work, the suffering, you don't gain that understanding, and there's no other way to to reach it than taking the road every day. That journey was a challenge as an actor, because it was hard, and not only on the physical level. In fact, that physical unease can be felt in the film. Kodi (Kodi Smit-McPhee, the boy who is the co-star of the movie) and I bared ourselves physically, as well as, even more importantly, psychically, to the mental aspects, the questions of the heart and soul. There was no other way of doing it. It was a challenge that attracted me and scared me at the same time. But as an actor it is necessary to have a little fear in order to learn and to do interesting things. How does an actor prepare himself for such a demanding role? On a physical level, obviously I had to lose weight. And trying to create the emotional state, I listened to certain music, read poetry, watched some movies that I thought were related to the story we were going to tell. But of greatest importance, on the one hand, was to gather the courage to tell the truth without words. On the other, to find a child who could endure this journey, who, in spite of being very young, would understand and could help bring out what this story required of me. If we didn't find a brilliant kid we didn't have a story, and we were lucky to find him. Javier Aguirresarobe's extraordinary photography also helps to reflect the state of mind of the characters in the film. I deeply admire Javier. He adapts to all kinds of movies, with big or small budgets, and can film in any situation, with a lot of light, with little light, with no light... He has a profound knowledge of his profession; he's of the old school. In The Road he was the one who suffered most from the weather, because he had to achieve those gray skies all the time. He has done very beautiful work; I hope that he is recognized for it. How do you explain a story as harsh and complex as McCarthy's to a child who's only twelve years old, the age Smit-McPhee was when he filmed the movie? Kodi's father, who's also an actor, read the book to him and he understood it completely. He didn't lie to him or conceal the most difficult or complicated parts. And Kodi understood it all, as well as anyone and better than many. Because of that, we were able to do what we did. Without his dedication I wouldn't have arrived at that state of emotion, of feeling. I wouldn't have been able to make that psychic journey in the way that I did. Anyway, even though it dealt with a hard story and the filming was hard as well because it was raining, it was snowing, it was very cold, you can't forget that Kodi is a child, and as such, he was having fun. Even so, come the moment to roll film, he transformed himself into the mature and talented actor that he is. The comradeship between you two is obvious on the screen. It is, isn't it? I think it shows, too, that you feel we have that complicity, that true relationship. Those are things that can't be faked. We became good friends very quickly and I came to love him as much as my own son. The truth is that he didn't just remind me a lot of my son when he was that age; he also made me remember my own childhood, the way I had of seeing things. What thoughts from childhood has taking part in The Road brought to your memory? I have two brothers, but I have always been quite the loner. And although I get along very well with people, I like to be alone and also think about difficult matters, about death. As a child I also thought a lot about death, and at first I didn't like the idea. When I found out, at a very early age, that people lived, got sick and died, I thought, "Why have those decisions been taken out of our hands when there's so much to do, to experience and enjoy?" But as I grew older, I resigned myself to accept and understand it as a natural part of life. Which doesn't mean I'm always happy and relaxed, but, in general, I've come to accept it. And to be able to tell this story, even though it's only a movie, has reminded me of the best: when everything is taken from you, as happens to the characters of The Road, you can still decide how to behave towards others. You alternate your career as an actor with literature, music and art. Do your plans include directing a film some day? I have the rights to a book that I'd like to bring to the screen, but, for now, I can only tell you it is a very difficult story to adapt and that it invites you to question yourself about violence.